Canada’s Best Small Winery of the Year 2015! Nestled in the Beamsville Bench appellation of Niagara, we believe less is more with our approach to “small lot” winemaking. The estate’s award-winning Rieslings and rare Small Lot Reds are coveted by collectors and wine lovers. Emma Garner (2015 Winemaker of the Year) invites you to taste our limited estate wines in a personalized seated tasting and discover the character of our vineyards with a winery tour. During her studies in the Oenology and Viticulture program at Brock University, Emma Garner travelled to Australia, New Zealand, France, Germany and British Columbia. Emma worked at Trius Winery, until 2005 when she began working for Thirty Bench Wine Makers, eventually becoming Thirty Bench winemaker in 2010. She believes in allowing the vineyard to express itself by making wine with minimal intervention. 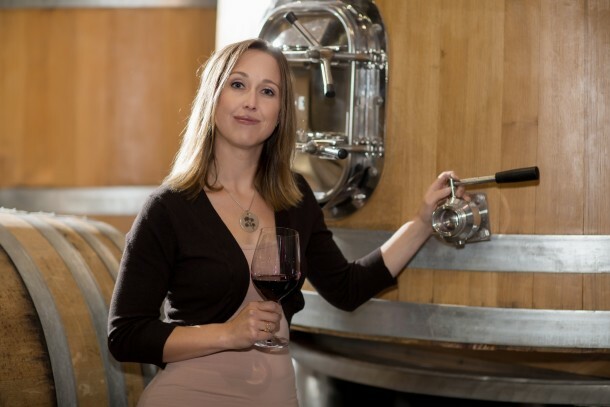 Emma received well-deserved recognition for her talents in 2015 as she was personally awarded Winemaker of the Year at the Ontario Wine Awards and Thirty Bench won Small Winery of the Year at the WineAlign National Wine Awards of Canada. At Thirty Bench Wine Makers we consider ourselves cool climate for a multitude of reasons! Perched perfectly on the Beamsville Bench, our property is the ideal distance from Lake Ontario. The slope of the land enables our vineyard to have excellent air and water drainage. The micro climate of our Beamsville Bench vineyard is fortunate enough to benefit from the moderating effect of Lake Ontario which provides cooler nights (and subsequent acid retention) as well as increased temperatures during the winter. As a result of this lake effect, our season extends later into the fall. The longer growing season coupled with western sun exposure results in fruit bursting with flavour and character. In order to allow the vineyard to express itself in the wine, we are not heavy handed when it comes to oak usage in our winemaking. The absence of malolactic fermentation and a measured amount of lees stirring also helps to keep our wines fresh and focused. Within in our vineyard we have two relatively small blocks of Chardonnay. By having two different clones (95/96), different harvest dates and different fermentation batches, we are able to make wines of exceptional complexity and quality. Our vines are 20 years old and are nestled perfectly in the middle of our property where they are able to take advantage of the constant air and water movement. The clay loam/limestone soils help to create wines with wonderful ageability and finesse.